The polls for the 2013 GoAbroad People's Choice Award and Innovative Student Video Award are now open for voting. Votes can be submitted daily, until May 29, 2013 at 11:59PM CST. 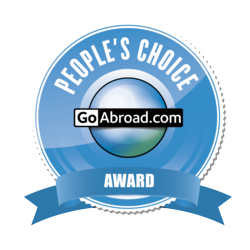 Cast your votes for the 2013 GoAbroad People's Choice Award and Innovative Student Video Award! GoAbroad.com announced the 2013 Innovation Award Finalists last week, and the team is now encouraging the public to submit their votes in the categories of Innovative Student Video and People's Choice. Unlike the other Innovation Award categories, these award winners are determined by a public, online poll. Voting will take place until May 29, 2013 at 11:59PM CST. Winners will then be announced at the GoAbroad Reception during NAFSA Annual Conference & Expo in St. Louis. The People's Choice Award honors the top international education organization as selected by study abroad professionals and students. The top five finalists in this category were chosen by study abroad advisers from colleges and universities throughout the United States. The Innovative Student Video Award recognizes a student-created video that captures the true essence of an international education program. These Finalist's videos demonstrate highlights of the program, an understanding of global awareness, and active student participation. The winner of this award will also receive a special giveaway during the Innovations Reception. For fifteen years, GoAbroad.com has been the web's premier resource for meaningful international experiences and alternative travel opportunities, providing the most up-to-date and accurate information on programs available worldwide. From GoAbroad's GoMedia services, which offer a distinct range of internet marketing solutions for international educators, to the prestigious GoAbroad Innovation Awards, and the newest initiative - FundMyTravel - an online crowd funding site to help students raise money for meaningful travel experiences (http://www.fundmytravel.com), the GoAbroad team is dedicated to providing the most comprehensive resources to the field of international education.